The Graph conference chair was created by designers jehs + laub for Wilkhahn and has already won a number of awards. 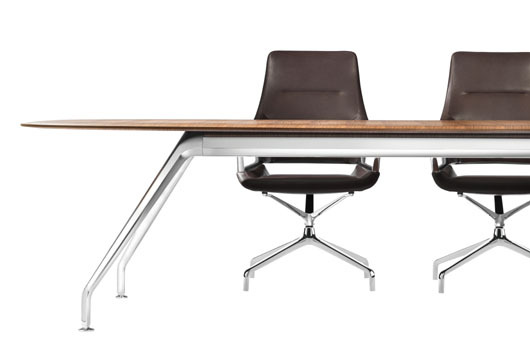 The designers have now gone a step further and developed a table range with Wilkhahn that also sets new standards. 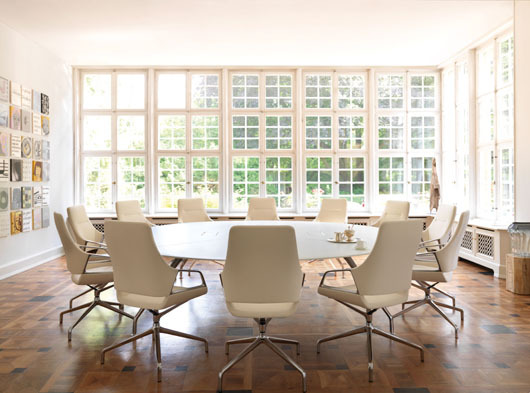 In terms of their striking look and functional excellence, the table and chairs appear the perfect match – an even rarer commodity than a well-designed conference chair. 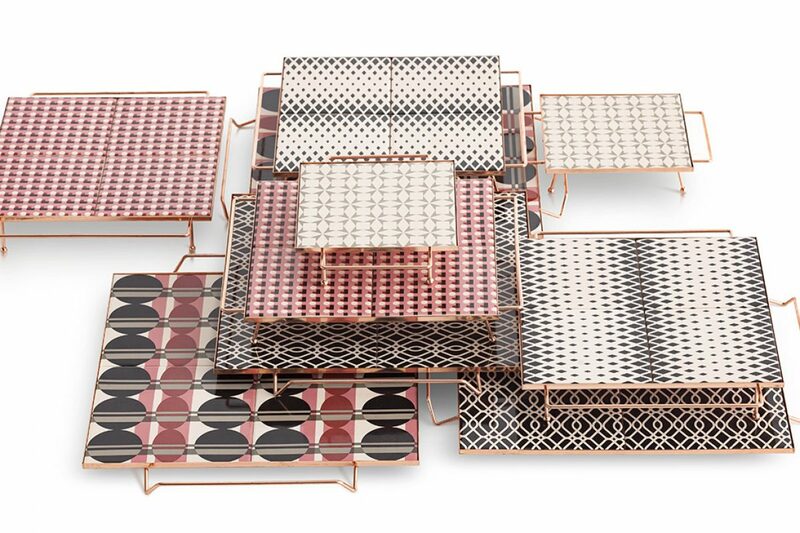 The Graph table reflects the design of the Graph chair. 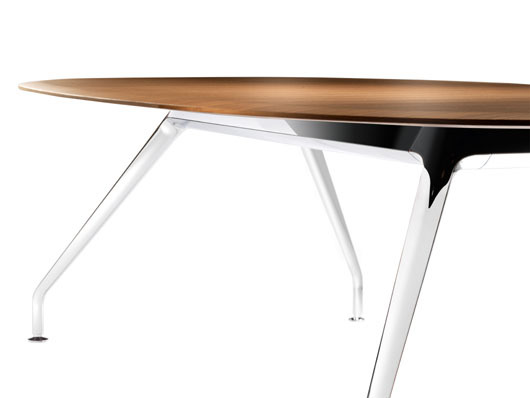 The curved and flat profile of the sloping table legs continues seamlessly in the aluminium underframes. Light lines materialise, suggesting the frame is formed from one single component and conveying the impression of weightless elegance. Although a modular system, each configuration looks like a dedicated design, an impression underscored by the large spans, the curved table edges and the rounded formats. The slender-looking tabletops offer haptics that feel pleasant and which are also repeated in the chair’s armrests. 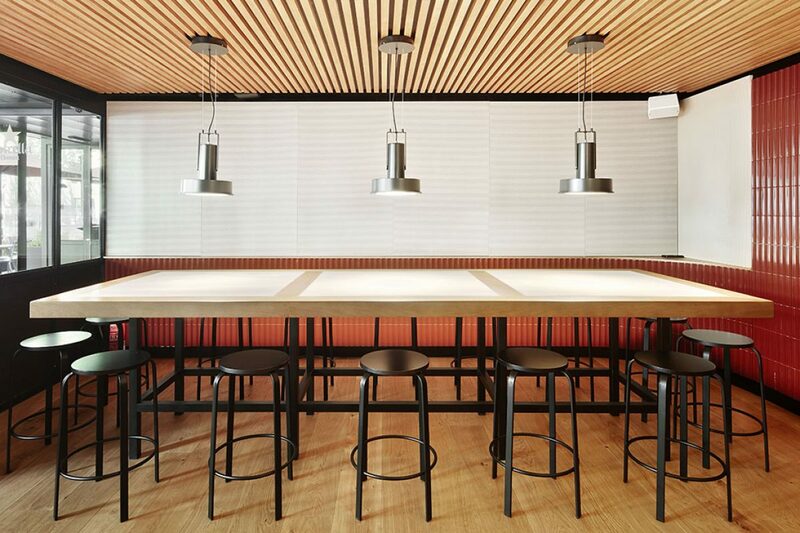 The table tops are attached using steel core panels on the underframes, producing generously sized tabletop overhang. 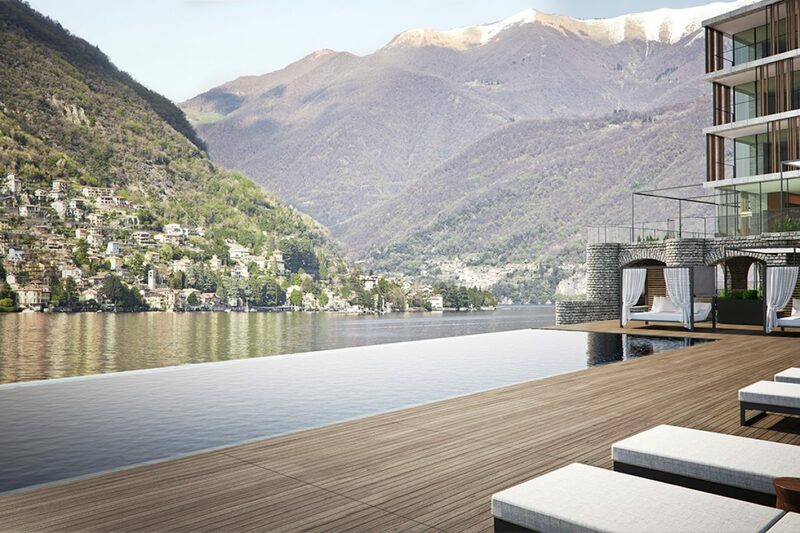 In addition to a sense of visual elegance, this solution allows plenty of leg room and space to stretch out. Graph boasts a characteristic and versatile design that integrates well with specific interior design concepts. The MDF table tops are coated white or black, or have various genuine wood veneers applied over the curved edges right up to the stylish outside edge. The table tops made of reinforced glass and coated black or white on the bottom emphasise the technical sophistication of the range. The frame surfaces are bright chrome plated, chrome plated with a matt polished finish, or optionally powder coated in black or white. The sizes of the Graph tables range from 120 by 120 centimetres up to 540 by 230 centimetres. 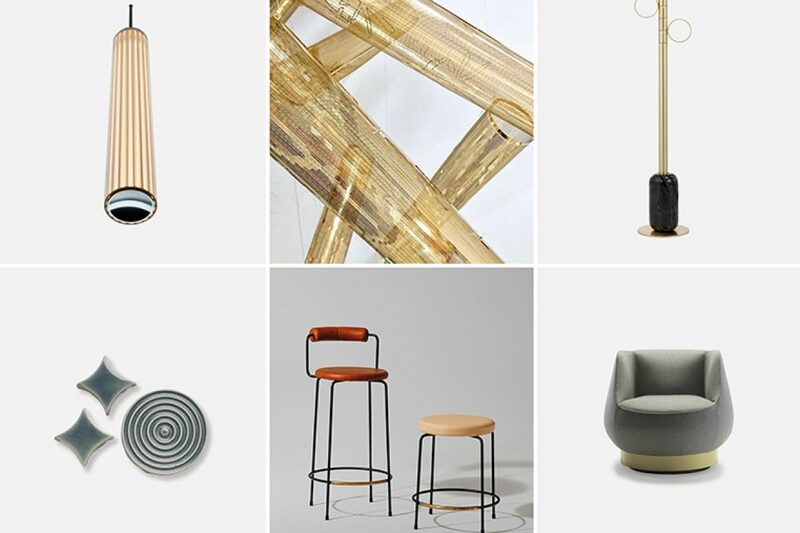 The formats include round tables (with only four legs, up to 300 centimetres in diameter and with space for 12 people) and rounded square tables, as well as long or compact oval shapes that are based on rectangles. The biggest table has room for 16 people. Multi-media equipment can be optionally integrated. The method is outstanding because it’s virtually invisible and doesn’t detract from the elegance and attractiveness of the table. 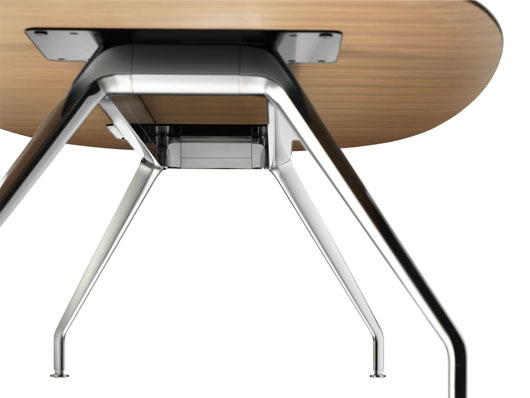 The shape of the underframe profiles provides generous storage space underneath the table top for retractable cable channels where all the fittings can disappear. 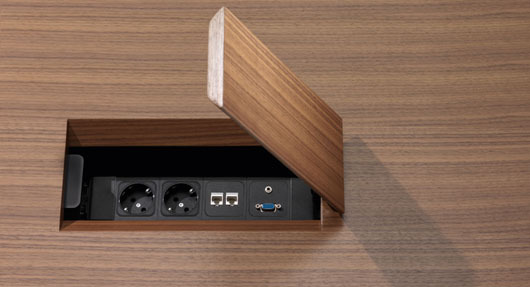 A convenient flap mechanism with gas lift opens the especially designed and perfectly integrated table portals.